It’s really not that cool outside, but I just can’t wait to wear some of my new fall pieces! My office is chilly, so I use that as an excuse. Anyway, on to my overly warm outfit…. 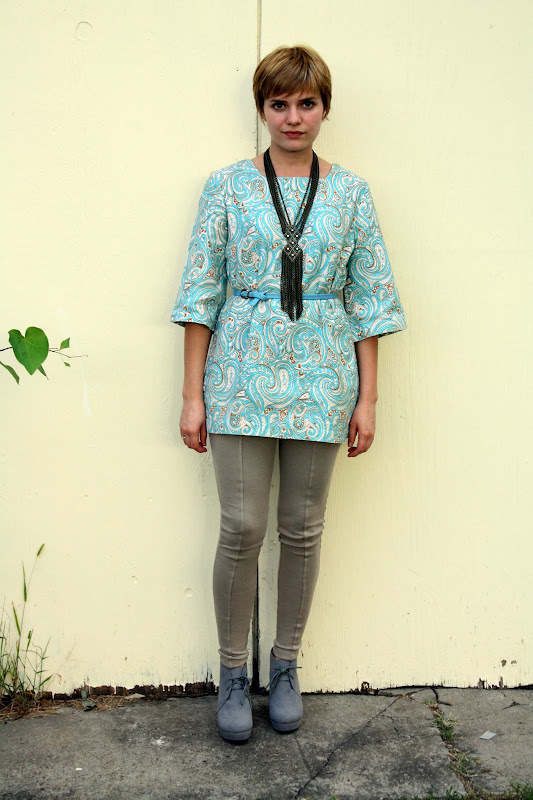 this handmade paisley tunic was another vintage find from last weekend. I like having a one-of-a-kind piece to temper the otherwise Forever 21-dominated ensemble. You might as well get used to the trouser-like leggings, edgy oversize necklace and lace-up wedge booties now, though, because I have a feeling they will all be essential components of my autumn wardrobe. I believe I’m going to wear the leggings again tomorrow, and I will share with you what made me so excited to find them! I love this mix of vintage and new items, and the colours of this outfit are amazing! 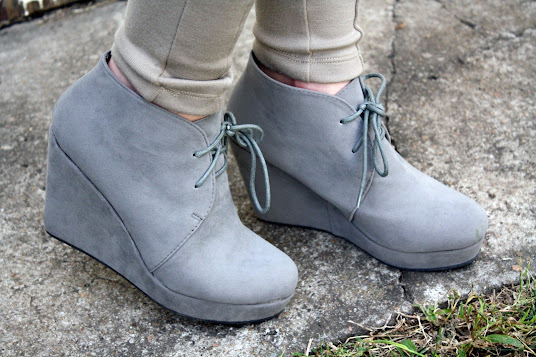 Those shoes are super cute--can't believe they're from F21! What a great necklace. It finishes the outfit perfectly! Can I please just be YOU? Just for a day so I could play dress up and look good in these awesome retro looks? Pretty please? that tunic is soooo rad! i love the paisley pattern and that shade of blue is pretty much my favorite color ever. I have never bought anything from Forever 21. I work right by one but since I get such a good discount at A'gaci, I always talk myself out of going in there! I like your blog. I hope you will become a follower of my blog too? That top with that necklace is just fabulous! love the boots! i have similar ones! Oh, wow, what a cute dress.. great boots, too.. I really like this. I would've never thought about this color combo. Srsly-I've went back to this pic a couple times. And I'm like WOW she really pulled this off. I love the boots too. Thanks for spreading the love of vintage mixin w/ today! So I have not visited your blog in a while so I am just now seeing your wildly adorable short haircut and well, you looks SO cute and SO cool! I am pretty sure I am going to do a blog post on your ultra cute style, I hope you don't mind! I love this outfit, It's so cold here in MI I wish we still had some warm weather! I'd totally wear this, I love it. Love the outfit the tunic and necklace are amazing!!! Wow. I'm ever so happy I found you. Your style is innovative and beautiful, and I love that I found another someone with *uncommon* short hair. 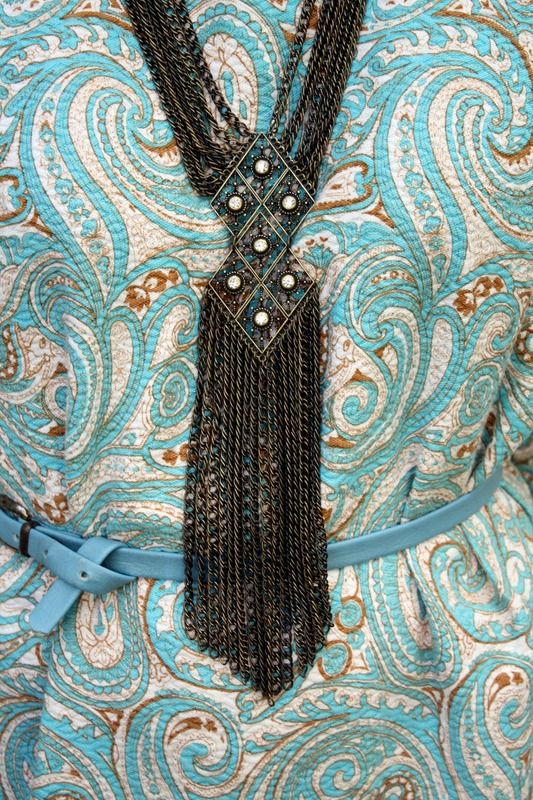 this vintage tunic is very nice! amazing necklace too! Awesome necklace! Still loving your new hair. That necklace is absolutely amazing! Wow. I was surprised to read that those were leggings, until I took a closer look. I thought they were gray skinny jeans! I love what you've done with this vintage tunic. And oh my goodness, those shoes! Of course I'm going to have to find those now... here I come, F21! love the tunic, esp with the necklace.. great colors!